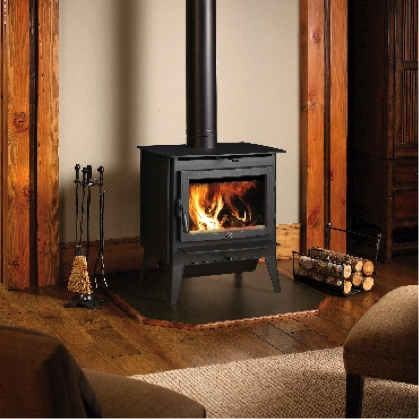 The evergreen features a more modern feel to a wood burning stove application. The mid-sized Evergreen™ wood stove hits the mark on performance, function and design. This sleek stove features gentle curved lines and complements any home’s décor while artfully presenting heavy gauge steel unibody construction and a cast iron door with a large, self-cleaning ceramic glass viewing area. The Evergreen™ features secondary combustion technology which reduces environmental pollution and increases the stove’s efficiency, allowing for cleaner, hotter fires that use less wood and save you money! The Evergreen’s standard bypass damper gives you full control over the flow of smoke inside this stove, eliminating smoky startups and reloads. The burn rate, from a mellow overnight burn to a large rolling fire, can be effortlessly managed by a single air control. The Evergreen™ is available in your choice of a Leg or Pedestal Model. Both models come standard with a large capacity ash pan that allows for quick and easy ash removal simply by sweeping ash from inside the stove down into the pan. An optional 400 CFM fan is also available with both models, which quickly and quietly distributes the Evergreen’s radiant heat throughout your home. Heating Capacity	Up to 2,000 Sq. Ft.